The 24 Hours of Lemons Forums → The Airplane-Powered MR2 → Never before has so little power been made from so much displacement! Topic: Never before has so little power been made from so much displacement! 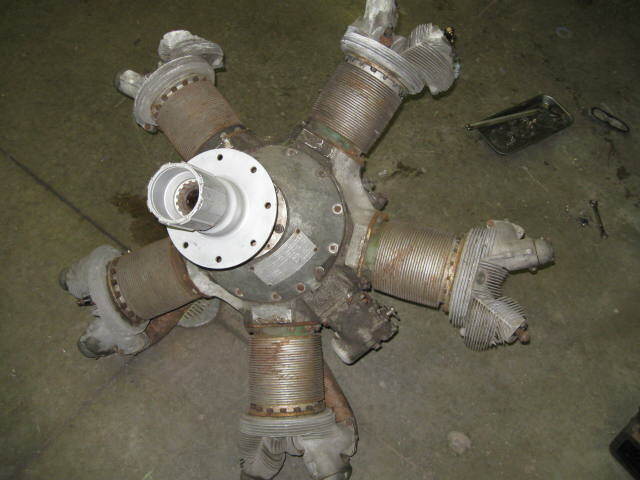 Radial engines are exempt from BS laps. this little beauty is from 1942. it was likely installed in a P22 World War II trainer aircraft. Re: Never before has so little power been made from so much displacement! Probably revs to 2000 rpm max! I'll be interesting to see, and hear, this running. Momentum is a terrible thing to waste. Fan-friggen-tastic! That will be awesome! From a straight safety perspectve - PLEASE be careful. Magnetos need to be grounded to be shut off. We won the IOE at Southern Discomfort. We got screwed at The Real Hoopties of New Jersey and we took cars down with us. We got the curse at Capitol Offense but they wouldn't let us destroy the car. There are no weak points in your plan. Full speed ahead! 2010 Detroit Irony 32nd/Capital Offense 68th/Grand Bull 26th/Rod Blago "FIF"
we've already got this problem covered. we're running the output through a 2.71:1 step-up gearbox before going to the automotive transmission. the rated takeoff RPM is 1850, cruise is 1800. but since we're not counting on it keeping us in the air we'll probably push a few extra hundred RPMs out of it. The motor came without left and right magneto and without a carb. after briefly looking at WWII plane parts prices we quickly decided to just fuel inject it instead. we'll be running a fairly benign distributor less coil setup and a 3 bar fuel rail. we sure hope so, this was most of our reason to go this way! This build will involve copious amounts of custom one off space shuttle parts. all 100% mission critical and 100% untested. this is full of awesome! i think this usurps any previous ill-advised engine swap TEN FOLD! will it be front mounded or what? that is still being decided. the motor is light enough to mount it in the front, but the visibility may be affected a bit too much with a big piston right in the middle. the first order of the day (month or two) is to get the motor running outside of the car. then i'll worry about the other details. yup, that's the model number. as for the claiming, i think the judges would rather see it over and over instead of having to haul a car from the mid-west to California that they cannot legaly drive over there. You are sick...and I say that with all the reverence and respect it carries around here. OTTER: "I think that this situation absolutely requires a really futile and stupid gesture be done on somebody's part." BLUTO: "We're just the guys to do it." Someone find this man a Goggomobil! You realize of course, that if you're going to really be true to the Fokker tri-plane, the crankshaft must be fixed to the fuselage, and the engine rotates in order to maximize gyroscopic effects on vehicle dynamics, and cool the engine. If it moves and shouldn't, use Duct Tape. If it should move and doesn't, use WD-40. If those don't work, its BROKE! What's the plan for cooling? Those were air-cooled, right? if someone can find us one of those, I'm DEFINITELY using it! sorry, our engine will be fixed. it's also an american engine, but it'll be close enough. this is where the fuel injection will come in. if necesary i may use a DBW throttle also so the pedal position is more directly related to the torque request. yes, it is air cooled. the plan involves lots of ducting, fans, 5 head temp gauges and water injection if necessary. Thanks for all the support guys! i think with this and the 2010 camry engined MR2 we can simultaneously have the oldest and the newest motor on the track at the same time! Actually, from what I understand of Diesel EFI is that the rate of air intake is constant and that throttle is controlled by pushing more/less fuel in, so EFI is a great idea. If all else fails use a CVT transmission out of a rolled-over murano/Ford Five Hundred. What could possibly go wrong? no no no, this is 540cubic inches of gasoline power! err, clarification, i am aware it's gasoline powered. I was just saying that from my understanding, the throttle could be controlled via fuel input through the EFI a la diesel-style.